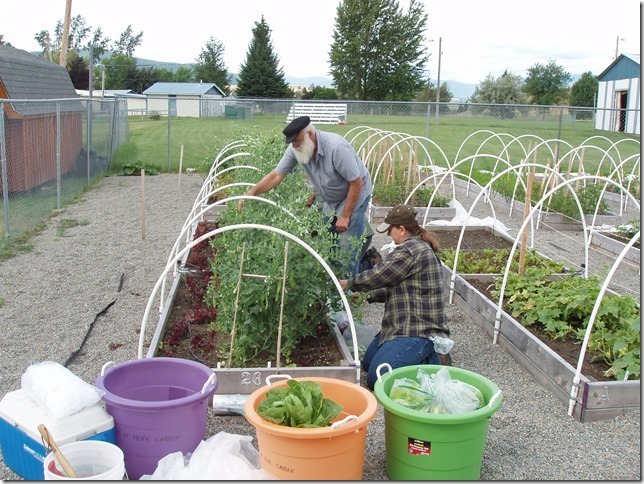 Jim Finley runs the Seeds of Hope Community Garden in Eureka, MT which has close to 50 beds for community members to use who otherwise wouldn’t be able to garden. The garden also grows food for the local food pantry and senior center donating an average of 700 lbs of vegetables a year! Born and raised in Kalispell, retired from the USDA geological survey, when I retired found a good deal on property up here in Eureka. I saw an advertisement for master gardener classes, it was a 3 year program, 8 weeks, once a week. As part of the community service part, I stasrted the community garden. Original intent was for people who couldn’t garden where they live because of the micro-climate living around eureka, or maybe they rent, or for assorted reasons they couldn’t have a graden at their home, provided an opportunity for people to garden. Also part of the cahrter was to donate to the food pantry and the senior center. We’ve been averaging about 700 lbs of produce a year! Last year was a little bit low because I had a couple of crops that didn’t perform well on me, so we only did 598 lbs that we donated. This year, we had a normal turnover rate, have about 25 people who have beds. There are 39 individual garden beds for rent. Then there are 10 additional beds. Rental beds are 4×8′ some are doubles that are 4×16′ that count as two beds. Then along the fence line 2 1/2 foot wide beds that are 8′ long along edge and that’s where we grow most of the vegetables for the food pantry and senior center. Always have an open house in the middle of April, that’s when we sign everybody up, most people keep the same bed as the previous year. Some people have multiple beds, one lady has 6 beds. How much does it cost for a bed? $20 for first bed, and $10 for each additional bed. And there’s more! We also provide drip irrigation system, water from the glen lake irrigation systems, and then the community fairgrounds. The Community Garden is located on the fairgrounds property, next to the horse barn and riding arena. Hwy 93 will get you over towards the baseball field. THere’s an old paved road it only goes back about a 10th of a mile, by Kidsville. This year we’re expanding the size of our beds to, add an additional 8 double-beds so we have 16 more bed rentals, and more growing area for the Food Pantry and Senior Center. They are deep beds with the dirt already in them, right? And have several beds to accommodate elderly or disabled people who have back problems, started with 3 beds that are 2 feet deep. Now we’ve added 4 more of those, so we have quite a few of those type of beds. Grew up with a garden, my dad had a garden probably since the time I was born, so as soon as I was old enough to pull weeds. Do you have brothers and sisters, do they garden too? My older brother does, and I don’t have a sister, and my younger brother doesn’t. My older brother likes to do more decorative gardening, like wildflowers and plants. Certain plants are definitley ph sensitive, like you can’t transplant huckleberries down into the valley very easily because they prefer an acidic soil and most of our soil is pretty alkaline. Does the elevation make a difference? I do think the elevation might make a difference. I was just in Glacier National Park and there are tons of flowers there blooming that I don’t think grow here because of the elevation difference and type of flowers. Some of them if you bring them down and plant them in the same type of environment, like shady sides or cooler areas, they’ll grow and bloom but they’ll bloom earlier and probably not as long. Mountain ones are more inclined to bloom right after the snow goes off. There was some kind of a lady slipper my dad used to grow on the north side of our house, from the Yaak River area. They did ok, would get a few blooms each year but they didn’t last real long and he kept having to replant them. Basically organic gardening is where you’re using non-concentrated salt fertilizers. You provide your basic nutrients using more manure type based fertilizers or compost from decomposed vegetable matter, a lot of that material is going to have live bacterias in it and more micro-nutrients. The other thing about organic is there’s no using volatile organic compounds to control weeds and pests which can lead to – you know – if used improperly can lead to pollution problems and that can lead to detrimental effects wherever you’r applying them. I’m not as strong against using Roundup or 2-4d as other people are, but those are things you don’t want to use it regularly. Corn and wheat farmers use it every year, my philosophy on that is it’s like giving kids pennicilin every time they get a cold, eventually they’ll start developing resistance that you’re trying to control. When ever I have a pest issue, like a cabbage beetle, I use BT (bacillus thuringiensis) works better on tent caterpillars then anything else. BT (bacillus thuringiensis) once they digest it it becomes parasitic to them. It wipes out the worms, works on cabbage worms, all kinds of chewing animals like that. It’s safe for soapworts, aphids. We had a really bad ahpid attack a year and a half ago, that actually defoliated broccoli plants. We stopped the infestation by spraying with the soap, but the vegetables were gone, we couldn’t save them. I never saw anything like that before. Some kind of environmental factor that just made it ideal for them grow, came late in the year, maybe the first week in September. We were harvesting side shoots on broccoli, and the cabbages infected by them too. That was the other thing, they only effected plants related to cold, some people had some kholarabi infected by it. Other plants that were in the beds didn’t seem to be effected by it. Never seen anything like that before and hopefully never will see it again. Well, I’m kind of inclined just to do the organic first. When I grew up we had horses, so we always used manure for the gardens, didn’t really use sprays for insects or anything like that. More on the fertilizer end of it that I have a tendency to be of the organic protocols. I’ve read several books on organic gardening and I’m always looking for new information. In my home garden I did real good with tomatoes, but I have a high tunnel, one of those hoops. In the community garden we do well with brocolli, normally do well with cucumbers, but they just didn’t grow very well last year, and the other one that surprised me was snap peas, they didn’t grow very well. We did good with bush beans, tomatoes, and zucchini. My home garden soil is really alkaline, almost the same as a bar of soap. Up there in the 8s, 8.6, so I have a hard time growing squashes. So I don’t even try to grow zucchini up here. After a few years of putting in compost it will get under control and I’ll eventually be able to effectively grow them. Last year I was so busy with the community garden I didn’t get to work on my home garden. One of the things that did do really well, and I learned this from Todd and Rebecca Ulizio (from Two Bear Farm – I interviewed Todd in Episode 3.) Planted fall spinach and rather then pulling it up at the end of fall season, I let it overwinter and it came up this spring, and in May I did 4 harvests every week, and at the end of May I got about a lb and half of spinach off of a 6 foot row. That’s one way if you really want a lot of spinach. When you plant spinach in the spring, by the time June rolls around it starts bolting. I’ve been getting spinach leaves the size of my hand. Plant for a fall harvest and let plants over winter. Is there something you would do different this year or want to try/new? Haven’t really thought about anything going to try new this year. One of the things I’ve been thinking about, sometime down the road I would like to play around with is Hydroponics, where you grow a fish tank and then you use the water off the fish tank to hydroponically feed your vegetable plants and they clean the water, and it goes back to the fish tank. It’s called Aquaponics. You can listen to the episodes with Liz Kim from Genesis Clark Farm in California and Maribou LaTour who has the Visionary Aquaponics Podcast. Aquaculture is Fish Farming, and Hydroponics is going in water and chemicals so Aquaponics combines the best of both worlds. Last year the cucumbers, this had to replant my beans and peas. Because of very poor emergence out of the soil, I suspect robins. I was digging in the holes, to see if they rotted, and there was no trace of the seeds being there, so I thought maybe something pulled them. Generally I have good luck with tomatoes, packman broccoli. I like that brand because they do the best of anything I for side shoots. It’s a variety, it’s a hybrid. It’s been around for years. But sometimes the heads will be classic big heads, or the initial head won’t be that big, but you cut the head off and the side shoots start developing, just when they’re opening up like they’re gonna go to seed you prune those off and it will develop another side shoot, if you keep fertilzing it and watering it all summer long, you’ll get a chest high plant that’s about 2 feet wide and you’ll get a whole shopping bag full of broccoli out of it. It’s a very high yield, that’s why I grow it for the community garden, I’ll get the weight half again in side shoots that I get from the original head. Last year I tried something new, and I heard if with cabbages, if you don’t pull the plant out after you harvest the head, it will grow side shoots. They weren’t as big, but there were 2-3 small heads soI almost doubled my weight in cabbages by letting the side shoots grow. That’s something I’m gonna baby along this year, maybe pull the heads a little earlier this year just to see if I can get more side shoots. You know how brussell sprouts, grow the little cabbage heads grow off the main stem, on a cabbage the main stem is fairly short, that’s where the leaves are, that cradles the cabbage head. The if you cut the head off you still have 2 or three rings of leaves around the base, between those leaves, cabbage heads will grow out sideways from that and then upward. Basically they are a side-shoot off the the main head’s been cut off so the growth comes off the main stem. Pole beans. About the time pole beans get going you’re within a week of the first frost. Some people can do it, I worked with a guy down in Kalispell and all he planted was pole beans, and he always did really well with them. I’ve never been able to grow pole beans very well, as soon as they come on it was within a couple of weeks of the first frost. You let something grow all summer long, and then you get a frost. Pretty much have to put a gun to my head to go weeding. I hate weeding. It’s not just a matter of going to pulling it out of the ground, but the crack grass and the thistles you have to dig down about a foot to get to the feeder root. I you follow a thistle all the way down you’ll find that there’s a horizontal root they all grow off of. We did the weed barrier at the community garden. Did that for a whole section of it. On the beds I have growing along the fence line, the quack grass grows up over the top of them into those beds.. At home, I have thought of starting a new garden but not plant anything in it to summer fallow it, and not let anything grow in it. That would be the best way to get rid of all the quake grass and the thistles. Eating harvest, pickin’ and eatin’. Probably my favorite vegetable currently right now it’s mustard greens. I like mustard greens a lot. If you eat ’em raw they’re wasabi hot! But if you cook em they’re actually better then collards or turnip greens. Mostly I just steam them, maybe throw in crumbled bacon. Just basically steamed, I don’t even add salt to it. One of my favorites – last year I grew a banana squash, about 20 inches long, I’d slice about ¾ inch off of each slice to throw in my stir fries, I also like to add cucumbers to my stir fry, especially if you buy cukes and they start to get a little bit wilted. I just chop em up and toss them in the stir fry. A lot of people don’t know you can eat the leaves of kholorabi. Leaves on kohlrabi make good steamed greens. It’s related to the cabbages, it forms a round ball. One varitety is about the size of a soft ball, flesh is white, skin if very fibrous, so you peel the skin off. It’s actually best eaten raw as a cut vegetable for dips, but traditional way is to boil it, so most people hate it, cause it tastes a lot like boiled cabbage, but it also is a good replacement for a turnip. Everything eats turnips. Turnips are a great sacrifice crop for your rooot crops, so it’s a good alternative because it grows above ground. There is a variety of kohlrabi from up in Alaska, where they have 24 hour sunlight by Fairbanks. Cossack variety can get as big as a pineapple, crisp. About a little over 20 years ago becask in the flathead, I had a prolific crop of broccoli, had a banana squash too that I ended up canning for a pumpkin pie filling, one of those years where everything grew perfect. Canning is one of my hobbies. Your traditional spring crops, plant them for fall harvest, like spinach, peas, and stuff like that, if you plant them in August, a lot of those things are frost tolerant, so if you can get through those first two frosts in September, you can have a garden halfway through October. Kale is a good one, and often you hear kale tastes best when it’s been frosted! It can grow into winter. It overwinters too. Then if you wanted to have carrots in the spring, you plant carrots in the summer, rather then harvest in October. Parsnips. Best advice for season extending, that way about the time you can start working the soil, you can go about picking your root crops and have fresh garde produce that way. Plant your traditional spring crops, plant them for fall harvest, and let them overwinter! Only thing I’ve entered into the produce section, is one year I entered for largest rutabaga that had two of the largest tap roots, it was about the size of a chicken. Most of my fair entries I get blue ribbons for is for my canning. I like canned beets. One year I made, when the frost was imminent,I had a bunch of immature cucumbers, I made gherkins, pickled gherkins, from immature cucumbers, I picked the ones that were firm, if they were soft I didn’t use them. They made great pickles, I didn’t get the blue ribbon I thought I deserved. I have this recipe for making a corn silk jelly. Cut off the brown part, boil them, strain them, then you add enough pectin and sugar to set it up, it makes a good jelly. It’ s real light flavored, it makes a very light jelly. Not a real strong flavor, you don’t have to do a lot of straining, just use. Will be about the color of honey, might even have to add the food coloring to make it yellow. It’s a hoe with a blade, that has a triangular point. That thing does an amazing job of pulling up dandelions. Goes right into the ground, won’t get the whole root, will cut about 3-4 inches and the tap root, and pop it out of the ground. Push straight down and twist, and the dandelion comes straight up. From my own personal garden, I don’t plant a lot of lettuce and spinach, and endive, at once, I do a succession planting, about a month apart. That way, some people recommend planting once a week, the way the weather, you can plant things like two weeks apart and they ripen at the same time. I do it about a month apart, so you don’t run into that problem. I tried doing lettuce starts, I transplanted them out when they were 3 inches tall, then I planted the lettuce seed. After it got over its transplant shock, the other lettuce planted from seed caught up to it. where I pull the carrots, for the companion planting thing. In between he tomatoes plants I put in lettuce for summer time. I didn’t have a real bumper. Had spinach growing in my high tunnel. It never bolted. Usually, I’ll use canola oil, and then once in a while, I’ll buy fresh ground peanut butter, and pour off the oil on the top. No, I hate the internet. A favorite reading material-book, mag, etc you can recommend? Cold Climate Gardening Lewis Hill, it’s a great book for season extending. Lots of good ideas. Usually what I do, on the 2nd and 3rd Thursday they have 2 different groups of people they distribute to, so I usually bring it to food pantry on Thursdays. Some restrictions, she doesn’t want us washing the vegetables before they bring them in, so they know they have to wash the vegetables when they get it home. Probably not that concerned about it, but I do try to encourage everybody to try to get into gardening, either urban gardening or get into hobby farming, it’s always good to know where your food comes from, its always good to get locally grown food, if someone wants to know about urban farming, nothing beats learning like experience. You can read a book, it can tell you all about it, but until you try it, then you can go back to the book and it will all make sense. One time I took scallions from the grocery store, I let them get up to about the size of my little finger, they improved in flavor so much. Just the quality in the taste if you can do any kind of herb garden, they have those little kits with an adjustable light. Singer Bruce Antherton he’s from Big Sandy out of Great Falls, he’s a Folk song singer.